Learner drivers could soon be asked to follow sat nav directions and reverse out of parking bays, as the Government looks to improve driving standards and cut the number of people killed or seriously injured on Britain’s roads. The Driver and Vehicle Standards Agency plans to implement the changes for the test in 2017. It will also extend the independent driving section of the test, from 10 to 20 minutes. Other changes on the table include asking learner drivers to demonstrate competence when it comes to operating important safety features of the car while driving, such as the heated rear screen or ventilation controls to demist the windscreen. Road traffic collisions accounts for over a quarter of all deaths for those between age 15 and 19. It's hoped that the new driving test will help lower the number of accidents among young drivers, who currently account for a fifth of the 2000 people killed on Britain's roads every year. Road traffic collisions account for over a quarter of all deaths for those between the age of 15 and 19. 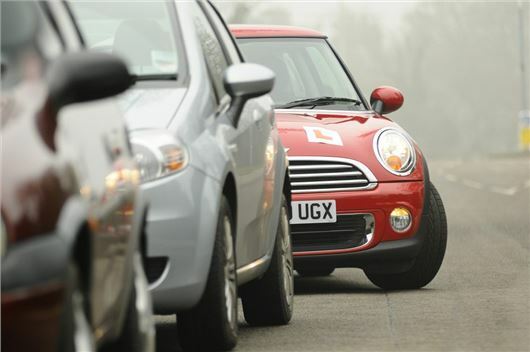 The new test has already been trialed with over 4000 learners and 850 driving instructors, across the UK. A consultation on the changes ended on 25 August and the new test could be introduced from January. Steve Gooding, the director of the RAC Foundation, said: “These proposed changes recognise that it is more important for candidates to demonstrate the ability to drive independently on high-risk roads than the skill of reversing into a quiet cul-de-sac. course 'off road ' ,similar to the motorbike scheme and the young driver scheme, before being allowed on public roads. I know that my daughters were far more confident when taking to the roads after such experiences. Young drivers do not really get a chance to experience handling a car properly without driving aids such as power steering and power brakes, so they never develop a 'feel' for driving a car and an ability to read what the car is telling them, through the controls, about the road surface. This can only get worse with the advent of anti lock brakes, lane assist, parking assist, automatic crash avoidance systems etc. They should all have to do a few hours in a basic no electronic driving aids car. I am a mature male driver who keeps up to date with things that change on our roads. I keep as far as possible to speed limits and I`m trusted by others to pick them up and drive safely and deliver them to their destination, Can someone tell me why I`m always being ``tailgated`` in my car even when I`m travelling at 60mph or worse at 70 mph on the appropiate roads. At lower speeds 30mph or 40 mph in built up or residential areas I can almost guarantee I`ll have a tailgater within a foot or two of my back bumper within a short space of time. The ``offenders`` are invariably young women around 20 to 25 years old and almost always blonde! Who is teaching them to drive like this - have they not been taught the two second rule?. In my travels I`m seeing more and more rear end shunts. The roads are not so crowded that every one is forced to drive within inches of the rear of the car in front. Most of these idiots are just looking for the brake lights of the vehicle in front of them rather than any thing happening several vehicles in front which was the way I was taught and I believe is similar to the advice given in ``Roadcraft`` the police driving manual. The perfect driver is not on the road and I don`t consider that I`m ``God`s Gift`` to car driving. I`m a believer that there should be a driving test every 3 years and for those over 40 years old an annual eyesight test. Driving Instructors are tested every 4 years. If I failed such a test then I would have to become conversant with current driving standards, road signs etc etc if I wanted / needed to drive on our roads.This is how to keep death and injuries down not just once in a lifetime driving test. I agree with (smartie) in most of what he says. The bit I don't agree with is the section where he or she calls for retests for those over 40. My opinion is that it wouldn't necessarily improve driving standards. Probably a medical to renew the driving licence every 3 years would do more good for over 70's. Driving Insrtuctors teach their pupils how to drive and drive safely. I think that anticipation of other roads users and looking far ahead and not just the vehicle in front is a must. Include a short commentary as part of the test. Rear end shunts should be a thing of the past. It is after the pupil has passed their driving test that the learning curve begins. I also think that if any driver regardless of age is proven to be responsible for a serious accident He or she should not be allowed back on the road until further driver training has been completed and signed off by the training organisation. I could go on but I think I have said enough. alone does NOT Kill anyone.. INAPPROPRIATE SPEED and INATTENTIVE DRIVING is what causes the majority of "Accidents"
Speeds above the speed limit i.e. the number on a pole! In collisions are less that 10% of the total so more that 90% of Killed and seriously injured collisions occur BELOW the speed limit!.. It amazes me that so many motorists believe it is safe to drive at the number on the pole regardless of conditions! IF drivers were trained to use their common sense instead of spending most of their time watching their speedometer instead of watching what is going on around them there would be far less problems.. TRAIN DRIVERS PROPERLY instead of teaching them to pass a test.. spend more of the motorists taxes on road maintenance and road safety! Get rid of Revenue Cameras Bedfordshire Police have admitted that the "Stealth Cameras" are there to generate revenue for the police via Speed awareness Courses Revenue Cameras are totally incapable of preventing dangerous drivers, road rage, uninsured, untaxed, unlicensed drivers, tailgaters, overloaded and mechanically unsound vehicles, Drunk and drugged drivers, stolen vehicles etc., We need More Police Patrol Cars back on the road! These guys are extremely highly trained and unlike cameras and magistrates use Common Sense and discretion! Fire the m****s who design confusing road junctions and multi lane roundabouts with traffic lights that do not allow non local motorists to find the correct lane to exit! Repair a few million Potholes and get rid of the upside down potholes we know as "Speed Humps" which wreck suspension and shock absorbers thereby making vehicles unsafe Allow the PROFESSIONAL Driving Instructors to set the guidelines NOT Idiot Politicians and Local Councillors who Know NOTHING! Wow! You guys should try driving in the USA ! Drivers here only have to prove they exist to get a driving license. The actual driving part of it consists of driving around 1 block. None of the complicated stuff like parking or emergency stops ! The UK test is already like a degree course compared to the USA one. As for the driving....Well Smartie, I am like you and leave space.....Only for some stupid driver ( who is more often than not texting ) to pull into that space with out using the really annoying blinkie blinkie things. They under take at every given chance, and tail gate ( which means another thing here ) as if it's an Olympic sport! I have seen people eating cereal @ 70+ on the inter states. Well, I concur with lots of the above comments on driving standards. I have been a member of IAM, and a military driving instructor. One point seems to be missing from all the comments on driving skills. they then use the same behaviour when getting behind the wheel of a car.. So what about an aptitude and behaviour test . I do wonder if its because they see how our LEADERS of the country behave. How they bend the rules to suit themselves, and when caught redhanded, conveniently sweep the details out of sight, and then apply "whats good for the goose is ok for the gander" creating the society we live in. acts of dangerous driving which go unpunished. I am 81 years old, and been driving for 63 years, most of them professionally , but when I am asked why I do not go out driving as much as I used to, I reply with much the same answers as I have stated here. I only drive when its absolutely nesessary or an emergency. Well The Majoreyeswater has a lot to say about the standard of driving tuition. I have been a qualified driving instructor since 1983 and have never just taught someone to drive to "pass a test". I and all the qualified ADI's I know teach people safe driving for life. How a person behaves behind the wheel of their car in the future cannot be a reflection on how they have been taught. I suspect the major has no concept of the rigorous and disciplined format the DSA strictly adhere to with the training and monitoring of driving instructors.There are of course many factors as to why accidents happen and it has been proved that young inexperienced drivers are among the most likely to have accidents but please do not publicly state the the reason is poor driving tuition from intructors when you obviously no nothing about the professional standards they apply.